INFORMATION-EDUCATION INFORMATION-EDUCATION-HISTORY This is a real Christmas miracle story, happened in December 1997 in Wisconsin, USA. This is a real Christmas miracle story, happened in December 1997 in Wisconsin, USA. A little girl named Sarah had leukemia and was not expected to live to see Christmas. Her brother and grandmother went to the mall to ask Mark Lenonard wh...o was a professional Santa Claus to visit the hospital to give Sarah the gift of hope through encouragement and prayer. Here goes the story. 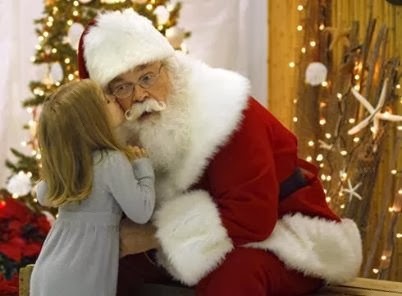 “She wanted to come with me to see you, oh, so very much, Santa!” – the child exclaimed. “She misses you.” – he added softly. Santa blinked and swallowed hard and told the woman to leave information with his elves as to where Sarah was, and he would see what he could do. Santa thought of little else the rest of that afternoon. He knew what he had to do. “What if it were MY child lying in that hospital bed, dying?” – he thought with a sinking heart, “This is the least I can do.” When Santa finished visiting all the boys and girls that evening, he retrieved from his helper the name of the hospital where Sarah was staying. He asked Rick, the assistant location manager how to get to Children’s Hospital. “Common….I’ll take you there.” – Rick said softly. Rick drove them to the hospital and came inside with Santa. They found out which room Sarah was in. A pale Rick said he would wait out in the hall. Santa quietly peeked into the room through the half-closed door and saw little Sarah on the bed. The room was full of what appeared to be her family; there was the grandmother and the girl’s brother he had met earlier that day. A woman whom he guessed was Sarah’s mother stood by the bed, gently pushing Sarah’s thin hair off her forehead. And another woman who he discovered later was Sarah’s aunt, sat in a chair near the bed with a weary, sad look on her face. They were talking quietly, and Santa could sense the warmth and closeness of the family, and their love and concern for Sarah. “Santa!” – shrieked little Sarah weakly, as she tried to escape her bed to run to him. Santa rushed to her side and gave her a warm hug. A child the tender age of his own son — 9 years old — gazed up at him with wonder and excitement. Her skin was pale and her short tresses bore telltale bald patches from the effects of chemotherapy. But all he saw when he looked at her was a pair of huge, blue eyes. His heart melted, and he had to force himself to choke back tears. Though his eyes were riveted upon Sarah’s face, he could hear the gasps and quiet sobbing of the women in the room. As he and Sarah began talking, the family crept quietly to the bedside one by one, squeezing Santa’s shoulder or his hand gratefully, whispering “Thank you” as they gazed sincerely at him with shining eyes. Santa and Sarah talked and talked, and she told him excitedly all the toys she wanted for Christmas, assuring him she’d been a very good girl that year. As their time together dwindled, Santa felt led in his spirit to pray for Sarah, and asked for permission from the girl’s mother. She nodded in agreement and the entire family circled around Sarah’s bed, holding hands. Santa looked intensely at Sarah and asked her if she believed in angels, “Oh, yes, Santa… I do!” – she exclaimed. “Yes, Santa!” – Sarah exclaimed, her eyes bright. He leaned down and kissed her on the forehead and left the room. Out in the hall, the minute Santa’s eyes met Rick’s, a look passed between them and they wept unashamed. “My only child is the same age as Sarah.” – he explained quietly. “This is the least I could do.” They nodded with understanding and hugged him. One year later, Santa Mark was again back on the set in Milwaukee for his six-week, seasonal job which he so loves to do. Several weeks went by and then one day a child came up to sit on his lap. Picture is for representative purposes only.